Describe a ratio relationship between two quantities. Compare ratios expressed in different ways. Use proportional reasoning to solve a real-world problem. Before the lesson, students work individually on an assessment task designed to reveal their current understanding and difficulties. You then review their solutions and create questions for students to consider, in order to improve their work. After a whole-class introduction, students work in groups, putting diagrams and descriptions of orange and soda mixtures into strength order. Students then compare their work with their peers. Next, in a whole-class discussion, students critique some sample work stating reasons why two mixtures would or wouldn’t taste the same. Students then revise and correct any misplaced cards. After a final whole-class discussion, students work individually either on a new assessment task, or return to the original task and try to improve their responses. Each student will need a mini-whiteboard, pen, and eraser, and a copy of Mixing Drinks and Mixing Drinks (revisited). Each small group of students will need the cut-up Card Set: Orange and Soda Mixtures and Card Set: Blank Cards, a sheet of poster paper and a glue stick. You may wish to have some orange juice and soda for mixing/tasting but this is not essential. 15 minutes before the lesson, a 100-minute lesson (or two 55-minute lessons), and 15 minutes in a follow-up lesson. Timings given are approximate and will depend on the needs of your class. 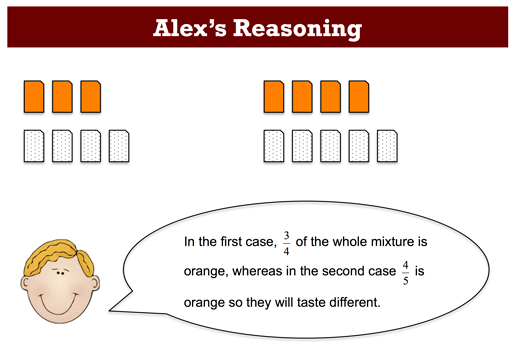 6.RP: Understand ratio concepts and use ratio reasoning to solve problems.